How many beautiful amphitheaters exist in the midst of the concrete jungle of New York City? Not too many, to be sure! But, Island Shakespeare’s got one and it’s absolutely lovely! Just minutes from the Upper East Side, among flowered parks with river views, Island Shakespeare performs the works of Shakespeare and others in one of the most beautiful hidden gems of all the city. Island Shakespeare strives to deliver exceptional theatrical performances featuring the works of William Shakespeare, with a dynamic group of artists home-based at the Eastwood Amphitheatre. Our purpose is to develop a creative dialogue that attracts a diversity of voices from Roosevelt Island, New York, and from all over the world. Under the leadership of Artistic Director Kristi Artinian and Managing Director Thomas R. Kee, Island Shakespeare glows with creativity, life, and new possibility! Lived in New York your whole life and never been to Roosevelt Island? New to the city and always wondered what that red gondola next to the 59th Street Bridge was? Come and explore the charm of Roosevelt Island, and then eat and drink as you enjoy the exceptional work of Island Shakespeare! When I first moved to Roosevelt Island, I thought I’d come through the wardrobe into Narnia. I couldn’t believe my luck — to find this hidden delight right smack in the middle of New York City. “Is it really possible,” I wondered, “that such a green and gorgeous place could exist ten minutes away from midtown Manhattan? Is it possible that these parks and flowery riverside walkways, so lovely and well kept, are even closer to NYC’s epicenter than Central Park? How is this not common NY knowledge?” I was in love with my Island, and soon learned that Roosevelt Island was the gift that kept on giving. Tom and I discovered the dynamic Eastwood Amphitheater on Roosevelt Island as we took a cool March stroll along the East River. 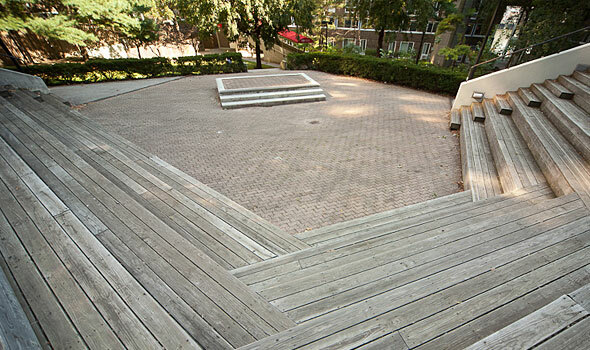 The Amphitheater was nestled into the landscape of Roosevelt Island, and was just minutes from the Tram and subway. What could be better, we thought, than bringing Shakespeare to this gorgeous place so that others could share our experience of Roosevelt Island?! The Tram ride takes you over the city and across the river — with views that take your breath away. The riverside walk to the amphitheater is green and beautiful, always with the refreshing breeze off of the river on your face. In just minutes you’ll be at the theater, which is dynamic and bursting with life and energy! Visitors will be able to enjoy the experience, not just of the audaciously new work being performed by the Island Shakespeare company, but the entire experience of traveling somewhere completely new, exciting, and still so close to home! Our work isn’t the same-old same-old. It’s relationship driven, it’s imaginative, new, young, and energetic! Take your family! Take your friends! Come play with us! We promise you a new experience you’ll never forget! Copyright © 2011 Unking'd. All rights reserved. Photography: Jeff Hampton.